Here's an overview about free available fanprojects. One is the "Foliant des Abenteurers" a german fanproject about a specific topic in each edition. 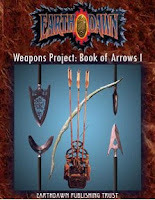 Second is the english "Weapon Project" from EDPT. So no matter if you are german or english, a lot of free material is available for Earthdawn, thanks to those fans that produced these sourcebooks. The topic of Foliant des Abenteurers Vol. 1 "Die Wolken lichten sich" means "Clearing clouds". Its content is about everything that is related to airshiptravel. Places you can only reach by airship are introduced, how you can use airships in your campaign, a new class of airships is introduced and of course new creatures, spells and items are provided in this edition. The topic of Foliant des Abenteuers Vol. 2 "Die Tore öffnen sich" means "Opening the gates". It presents a lot of stuff about kaers. The life in Kaers is described, campaigns and the magic that was used in Kaers is defined. Further several knacks, treasuries and a new discipline are provided in this edition. The third edition of Foliant des Abenteurers "Die Reise beginnt" ("The journey starts") gives a lot of informations about the life on the roads or the dangers beside the roads. Also some places you reach when you travel with a merchant are presented. Of course knacks, spells, magical items and creatures you'll need/meet on your journey are introduced. The fourth edition of the FDA “Die Wildnis ruft” offers a lot of suggestions what can happen in the wilderness of Barsaive. Topics are for example: the tribe of the K'stulaami is described, the discipline of the Shaman is described in detail and in another chapter are rules and examples given for the use of herbs and poisons. This special edition is about the city of thieves "Kratas". The city itself is described with its localities and taverns. Important persons are introduced and gamehooks are provided. The "book of arrows" nothing left to tell. 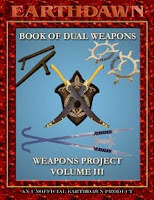 This book is about the use of dualweapons, which a lot of t'skrang swordmasters prefer. Some dual weapons of the Cathay are also introduced beside normal dual weapons. The "Book of Swords" contains swords from a lot of different races, from the crystalraider- to human tribe- and several windling blades. Some magical swords and some optional rules are given. Letztes Jahr fand in Essen die Spiel 2007 statt. Dort unterwegs war DORP-TV. Entscheidend für mein Interesse ist natürlich der Bericht vom Red Brick Stand. "Seriously, we had a fantastic time at Spiel, meeting so many awesome people, and just in awe of the event. RedBrick *will* be at Spiel again in 2008. Unfortunately, these things are not cheap, so we will likely not be attending a US convention this year (sorry). In 2009, however, we hope to be able to do so." Was für alle Earthdawn-Fans nähe Essen heisst, ein Besuch auf der Spiel 2008 lohnt!!! All Gamemasters should have some maps in their hands to tell their players where they are and simply to give them an overview of their journey or the land of Barsaive in general. These pictures include some old elven maps found on gallery of EDPT. Also some physical maps and handout maps are included. Some maps have been coloured by SaDE an earthdawn artist i gonna introduce in one of the following posts. Earthdawn is a high fantasy pen-and-paper roleplaying game based on a post apocalyptic scenario. On many different webpages you can find explanations of the game. Two of the best descriptions come from Red Brick FASA and Wikipedia of course. If you want to read some reviews head over to RPG.net, they reviewed the Earthdawn Third Edition Player’s Guide. If you want to know more about the Red Brick edition, here's a video review of Red Bricks Classic Earthdawn Edition by Kurt Wiegels Game Geeks. Over here you’ll find an overview of various downloads that were mentioned on the Earthdawn Blog. Even if you expect a “direct download” – section, some links only point to the article because there are several versions or documents to find or because you should first read the article before downloading.